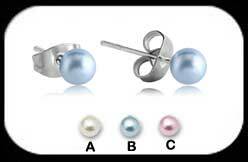 Synthetic Pearl Stud earrings with 3mm or 5mm pearl, made from 316L surgical steel. Available in cream, light blue or pink. Stud earrings are supplied as a pair (2) with butterfly backs.